Dr. Zachary D. Rethorn - Social Determinants of Health - What and Why? It is not enough to simply advocate for individuals to make good choices. To fix the massive problems in health we have in our country, we need to start where health starts, not just where it ends. 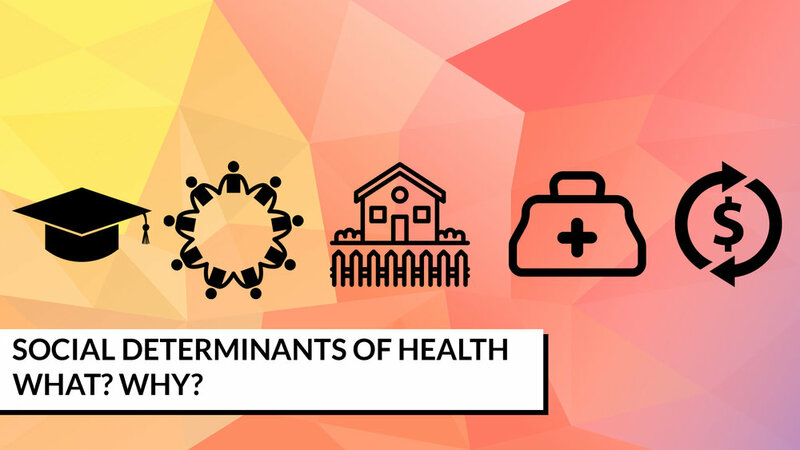 The conditions in which people are born, grow, work, live, and age, and the wider set of forces and systems shaping the conditions of daily life are called the social determinants of health. Over the last several decades, we’ve come to understand that these factors play a powerful role in shaping our health. We know that we are not as healthy as we could be. We keep getting fatter and more and more of us are getting diseases like diabetes and heart disease. Certainly, our behaviors need to change. But the narrative in our country is one in which personal responsibility is emphasized so much that we can forget we live in communities and systems which influence the choices we make. Say you have a prized rose bush (like I do). If it doesn’t bloom this year am I going to uproot it, chuck it out, and get a new one? Of course not! When a flower doesn't bloom you fix the environment in which it grows. Not the flower. In a similar way we need to look beyond the individual behaviors to the causes of the causes of poor health in our country. We need to keep in mind that the community and culture we live in will influence what behaviors and choices seem normal and make sense to us. There are five areas which have been identified as key objectives to improve the health all Americans – economic stability, education, social and community context, health and health care, and neighborhood and the built environment. Since the mid 1800’s, researchers have acknowledged the health impact of socioeconomics. It makes sense that those in abject poverty would have poor health. But the reality is that there is a health gradient. The wealthier you are, the better health you will have – all the way to the top. On average, the wealthiest Americans will live 10-15 years longer than the poorest. Education is a key to improving the health of our communities as well through several pathways. First, education provides opportunities for better health. Folks who are more educated are more likely to have better jobs with less stress and benefits like health insurance and paid leave. They are also likely to have higher earnings which can be used for healthy foods, health services like preventative office visits. Another key area by which education can improve health is the personal social and psychological benefits. People with higher incomes are spared the effects of continued social and economic hardship. For instance, I had a patient who was a high performing executive who was able to use a combination of working from home and paid leave to help buffer the effects of his stressful work. Education also provides people with skills like perseverance, a sense of personal control, and flexibility which influence the choices the way they manage their health. Adults who have significant education also tend to have larger and more robust social networks which can provide access to more emotional, psychological, and financial resources to improve health. Conversely, poor health is not only a result of lower educational attainment, it can also cause educational roadblocks and interfere with schooling. For instance, children with chronic diseases such as asthma much have more missed days from class. Or even when they are in class, it may be more difficulty to focus. I have had many patients walk through my doors who have been in this situation. One in particular had a connective tissue disorder which caused back and leg pain and made sitting in school difficult. Over the two years that I worked with her, she missed many days of school to go to physician appointments or to come see me if she was in too much pain to concentrate. The bottom line is that healthier students are better learners, and better learners are healthier students. Another important area which affects health is by exposure to conditions in the home and community. Especially in childhood, exposure to stressful conditions (adverse childhood experiences) can affect brain development and lead to many chronic diseases. It may even increase the number of painful medical conditions developed later in life. What may be the most pernicious consequence of these stressful experiences is that they increase risks for these same stressors in the next generation, leading to a cycle of intergenerational vulnerability. The context of healthcare itself can play a role in the health of a community as well. Access to care can be a barrier because seeing someone, anyone, can be expensive. Without health insurance, that expense becomes unaffordable. More than half of all unpaid personal debts sent to collection agencies are for medical bills. Even for those with health insurance, over 1/3 of Americans with difficulty paying medical bills had to choose between paying those bills and paying for food, heat, or housing. Quality of care can also be a factor in determining health. Healthcare infrastructure is often diverted to higher income neighborhoods which results in fewer clinicians in low income neighborhoods. Moreover, these clinicians are more likely to be less educated and less qualified than those in other neighborhoods. I saw this first hand working in the Orchard Knob neighborhood for two and a half years. The median income in the area is around $13,000 and the neighborhood is about 57% African American. And the quality of care by the neighborhood providers is shocking. I had so many patients with undiagnosed conditions which are obvious with any health screening (diabetes, hypertension, etc). The primary care clinics just didn’t spend the time with the patients to see these things. What community and home you physically live in can also affect your health. Inadequate or housing in disrepair can lead to increased exposure to lead, pests, air pollution, and other contaminants. More alarmingly poor urban planning and inadequate housing may contribute to physical and mental health problems like anxiety, depression, asthma, heart disease and obesity. Even the physical construct of the urban environment promotes social isolation and contribute to downstream effects like obesity and cardiovascular disease. Further, living in communities close to major thoroughfares can increase the effects of pollution such as ground-level ozone and particulate matter which may lead to lung diseases. We need to look beyond the individual behaviors to the causes of the causes of poor health in our country. We need to keep in mind that the community and culture we live in will influence what behaviors and choices seem normal and make sense to us. Taken together, the contributions of social factors toward our health is substantial. One analysis estimated that in 2000, as many people died from low education, racial segregation, and low social support as from myocardial infarction (the leading cause of death in 2000), cerebrovascular disease, and lung cancer respectively. Don’t live in a deprived area. If you do move. Don’t be disabled or have a disabled child. Don’t work in a stressful, low-paid manual job. Don’t live in damp, low-quality housing or be homeless. Be able to afford to pay for social activities and annual holidays. Don’t be a lone parent. Claim all benefits to which you are entitled. Be able to afford to own a car. Use education to improve your socioeconomic position. It should be obvious that this second list is really beyond the control of any on individual. The point is that it is not enough to simply advocate for individuals to make good choices. To fix the massive problems in health we have in our country, we need to start where health starts, not just where it ends. The United States leads the world in medical research and care. We spend the most money per person on health care in the world. But for many health indicators like life expectancy we have fallen behind countries like Cuba and Brunei. The only way to reverse this trend is to recognize that all Americans should have an equal opportunity to make the healthy choice the easy choice and allow them to live a long, healthy life.